One of the world's BEST KEPT secrets is Heritage Quest! This online database service is FREE to library card holders for most public libraries across the United States. In most cases you can access online at home, while you browse in your pajamas! In addition to having thousands of books scanned, online for your immediate genealogy use, they have the 1790, 1800, 1810, 1820, 1860, 1870, 1890, 1900, 1920 and 1930 (partial) for your use. Also included in this wonderful free service is access to online newspapers and other terrific genealogy items! that contains the word subscribe and nothing else. Now you can search the archives of all previous messages sent through the system. and enter lastjame as the name of the list you want to search. 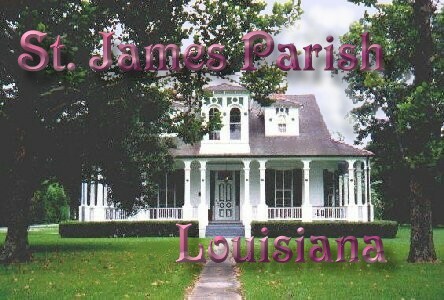 St. James Parish GenWeb Site! Nothing copyrighted, unless you have written permission from the author. Please contact me, Jana or Jim Webre, ST. James Parish Coordinators, if you would like to add your public domain documents to the archives. been donated by other researchers, such as yourself. Please do not send queries here, and we do not do private research, look-ups, answer family or county queries here at the archives. If you need to contact a researcher, you may email us at stjamesparish@jwebre.com to request a list of researchers. Be sure to mark your inquiry as "Need St. James Researcher List".